New teen fashion is coming up and changes seemingly every day. Sure, you could look on various apps for some ideas on teen outfits for school and on the weekends, but if you’re looking for teen outfits on Pinterest, you could be on there for hours before you find one she likes. Some teenage girls prefer comfort over everything else, so we’ve made sure to factor that into our guide. However, we’ve also added plenty that is downright trendy and flattering for various body types. An excellent way to experiment with self-expression is to wear clothes that really suit you, which is why we’ve included a variety of styles and options below. Let’s get started! When it comes time to take finals, the SATs, or any other important test, it’s important to place the majority of our focus on what we’ve learned, not what we’re wearing. However, that doesn’t mean you still can’t look cute while doing it! 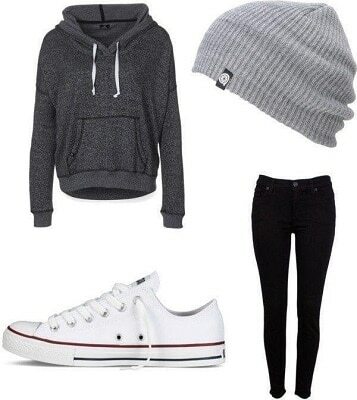 Go for a sporty/casual look with a cozy hoodie, a grey beanie, and some low-key Converse. Some days teen style should just be simple; nothing elaborate or well thought-out. Just something simple that can easily be worn at home hanging out, just as well as it could be worn to In-N-Out or the mall for hanging out with friends. A simple white or any plain t-shirt with some boyfriend-style ripped jeans and a flannel tied at the waist will do! Matching can easily go wrong, but it can just as easily go right. The key is to pick an outfit that doesn’t have to be the exact same shade, and also isn’t a super bright color that’s going to make you look like a crossing guard. 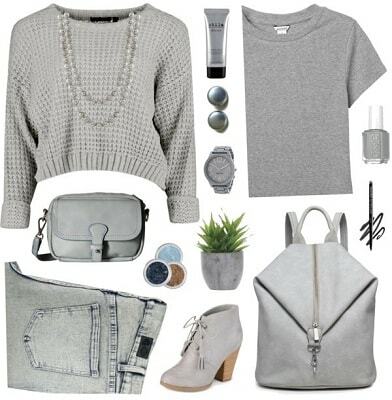 Grey is our personal favorite shade to pull a monochrome look off, since the different shades look good together, and it’s very subtle and easy to the eyes. 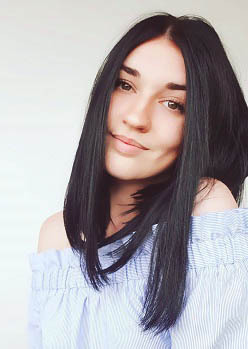 There are plenty of cute clothes for teen girls out there, you just have to know what to look for. If you or the teen you’re shopping for are going to a concert soon, you know how important it is to look and feel confident. Ripped jeans and leggings are in style now more than ever. Pair it with a long, edgy shirt, a cute black hat, and a leather handbag, and you’re all set. So, you’re going on vacation but don’t know what to wear. Don’t fret! It doesn’t have to be that complicated. Stick with a (preferably white) t-shirt that’s loose and soft-feeling just in case you end up getting sunburnt. Pineapples make everything cuter, so why not have them on your shorts? Don’t forget a gorgeous pair of sandals and shades that match, and you’re all set! We may get all sweaty, but we still want to feel good about what we’re wearing! There are all kinds of workout clothes for teens, but not all of them are what you’re looking for. Go with a cute, simple pair of Terry shorts and a cotton t-shirt to match. Or perhaps you want something a little more modest or warm. You can never go wrong with Nike; especially their leggings! Don’t forget the sneakers to finish the look off. If you’re not a Nike fan, we all know that Adidas is in and bigger than ever. Want something casual but still looking like you own the streets? Check this outfit out. 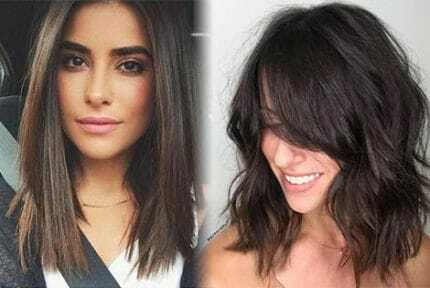 It’s simple but super trendy. 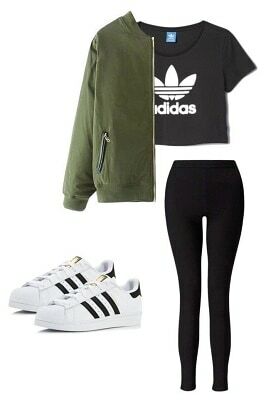 Adidas Originals, leggings or black jeans, a cropped tee, and a cute forest green bomber over the top. Looking for something a bit more head-turning? Perhaps something you’d see in a music video that you could easily wear to a show just as well as to the classroom? Throw on a solid-colored snapback like this leather one, a long, sporty t-shirt with short shorts, some kicks, and don’t forget the socks (they make the look). A crucial part of any teen’s education is studying. Who says you have to dress boring while studying? Not only will you fit right in while standing out in all the best ways at the café, you’ll be nice and cozy! A knitted sweater, and infinity scarf paired with a pair of burgundy skinny jeans and brown leather boots and you’ll be working your way to straight A’s! Perhaps you live in a warmer climate and would be melting if you even stepped foot near a sweater. That’s okay! We have a cute outfit ready for you no matter the weather. We still kept the infinity scarf just in case the AC gets to be too much. A simple tee paired with some distressed jeans and soft moccasins are just the fit you need if you’re going for comfy casual while still staying fashionable. Don’t forget the Naked2 Palette to make those eyes pop after hours of hitting the books! Maybe you haven’t had your coffee yet or you ended up pulling an all-nighter from studying or texting your crush. Let’s be real; it happens more than we’d like to admit to our parents. Throw on a pair of luxurious joggers, a t-shirt, chunky scarf, and some Converse, and you’re ready to take on the day. We all have to start out somewhere; why not start out on the right foot with an adorable outfit for your interview that will make you stand out from the rest? We put a couple options down, depending on how casual you want to go or how much you want to dress your lookup. If you want the more traditional “scholarly” look, then a nice blazer paired with a complimentary sweater, scarf, and jeans could be just the look you need for touring campuses to meeting with managers. Remember not to wear ripped jeans for this one. Just because you don’t have a motorcycle doesn’t mean you can’t look like it! Everyone loves a form-fitting leather jacket. Why not throw it over a flirty black t-shirt or crop top, along with some black skinny jeans, and moto boots? You can go for a more comfortable, casual-yet-edgy look by pairing your jacket instead with some leggings and either Converse or kicks like some Jordans, too. This outfit transfers perfectly from the gym to a date night. No matter which cute outfit for teenage girls you decide on, you can rest assured you’ll be a head-turner. Remember to always choose what suits you, and not what you think others will like. Fashion is all about expressing yourself and wearing what makes you look and feel more confident!